Haven't decided what will insulate the front of the house? Choose Styrofoam EPS 16 Facade! For a long time will protect your home from heat leaks, protect the walls from freezing, bring comfort to the house. 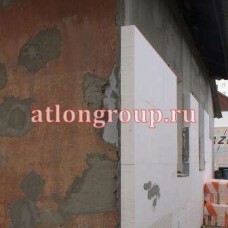 This insulation will hide irregularities, and after finishing the facade, will please the appearance. It is easy enough to work with expanded polystyrene; it is possible to protect and paint external walls independently. The basement of the house can also be insulated with these sheets. Information about facade works can be found in our articles. Discounts or free shipping from 30 cubes!